Feeding your cat with the same foods you eat is nice and gives an amazing feel, like that you two are sharing food. 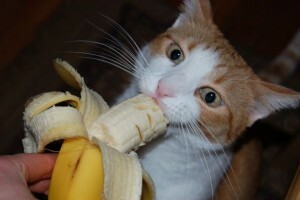 On the other side, some foods that are great for humans, may be toxic to cats, so you should avoid them. In general, most foods that we eat can be given to cats, but there are some foods that must be avoided. 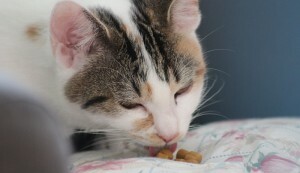 Due to the fact, most cat owners eat bread, this is the most common human food that is given to cats. Explaining is it healthy and should you do this isn’t very simple, simply because there are too many variations when you feed your cat with bread. Should you feed a cat with bread? If your cat lives in the open, so she has access to natural food, such as birds and mice, giving her bread is less dangerous. In addition, bread isn’t toxic to cats, but it shouldn’t be the main part of the diet. On the other side, the type of food and other additions have an important role. Brown bread is rich in fiber, so it is good for humans, but cats won’t experience this benefit. Simply said, there is no point of feeding your cat with bread. White bread has even less benefits to humans, but it has the same effect on cats. Feeding a cat with small amounts of bread is possible, due to the fact it has no positive nor negative effects. However, don’t expect any benefits. A more complicated question relates to sauces and dips that are commonly given to cats with bread. 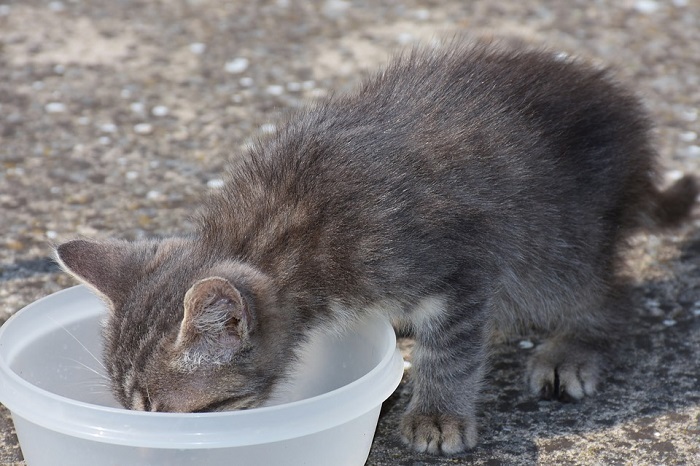 Keep in mind that some meals are not good for cats, due to the fact they may have a negative effect on they health. One of those foods is peanut butter. Although, small amounts are harmless, large portions may stick to the throat and cause choking! It is recommended not to give peanut butter with or without bread. This applies to similar foods as well. Store sliced bread is another treat. It is rich in preservatives, salt and sugar. All of these cats do not need nor will they have some benefitsif they eat this bread. It is advised not to give this type of bread to your cat. If you still do it, give only small amounts of it. Bread dough is something you will have to avoid at all cost. Some cat owners make a mistake and give it to their cats. This is absolutely the worst thing they can do, simply because it has a lot of negative effects and it isn’t healthy. Dough will rise in the stomach of your cat, and cause many problems. Your pet will start breathing heaving, the abdomen will be swollen and the blood flow in the stomach will be reduced. Depending on how much your cat has eaten the dough, severe issues are possible. This will also cause pain to your pet, so it is one more reason why you should avoid giving bread dough to your cat. Another threat is if your cat eats bread dough without your knowledge. This happens more often than you may think, so it is a wise decision not to leave bread dough on the table, when you are away. In some rare cases, cats develop alcohol poisoning. The symptoms are: vomiting, dizziness and your cat will have problems walking. This may cause coma and even death. If this happens, make sure you take your pet to a veterinarian. As you now know, feeding your cat with bread isn’t mandatory and isn’t recommended. If you still want to feed here with bread, avoid dips and sauces. Also, avoid bought slices of bread, due to the fact they have preservatives that may cause severe uses. A better choice is to give bread that you make. This type of bread has less harmful chemicals and it is safer for cats, but it isn’t mandatory part of a cat’s diet as well. Hot bread, that is too soft and looks wet, must be avoided as well, due to the fact it will get hard in the stomach. All of this means that bread should be a part of your cat’s diet and it is better not to feed your cat with it. Don’t forget the dangers of bread dough. It is far more dangerous than bread and most other foods, so it can cause severe issues and it is a much better choice to protect your cat from it. Make sure your pet won’t be in touch with bread dough while you are away, due to the fact she may eat a large amount. Still, if this happens, take your pet to a veterinarian as soon as possible. Very small amounts of bread dough aren’t dangerous, so you don’t have reasons to worry about.